Located on a vibrant road of Charoenkrung, Bangkok, Long Zhu Guesthouse offers a restaurant, Thai and Chinese massage service, and free WiFi. It is 1.8 km from Saphan Taksin BTS Skytrain Station. Each room has air conditioning. Some units come with a cable TV and a seating area. The private bathroom provides shower facilities and free toiletries. Slippers are also available. At Guesthouse Long Zhu , guests can have a service from a 24-hour front desk, a shared lounge and luggage storage. Guests can have their trip arranged by a tour desk. 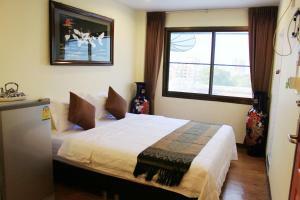 This accommodation is 3.8 km from Patpong and 3.8 km from MRT-Hua Lamphong. Asiatique the Riverfront can be reached within a 10-min walk. For flights, Suvarnabhumi Airport is 27 km away. Guests can enjoy Thai and Chinese cuisine at the Long Zhu restaurant. This twin/double room has a electric kettle, dining area and seating area. Rate: THB 999.00 ... THB 1680.00; select dates below to get current rates. This triple room features a dining area, electric kettle and air conditioning. Rate: THB 1299.00 ... THB 1680.00; select dates below to get current rates. This double room has a dining area, electric kettle and seating area. Rate: THB 799.00 ... THB 1680.00; select dates below to get current rates. This double room has a patio, electric kettle and seating area. This double room has a electric kettle, satellite TV and air conditioning.